Yes, it’s been an insanely long time since I last posted, & I do apologize! Did you know that tomorrow (19 July) marks the beginning of National Moth Week? Well, now you know! Time to give those fuzzy, fluttery nocturnal visitors a little respect. So I created an Etsy treasury in honor of the light-seeking beasties. One of my favorite things about having an Etsy shop is seeing all the other Etsians’ inspiring creations. Aren’t these mothworks amazing? 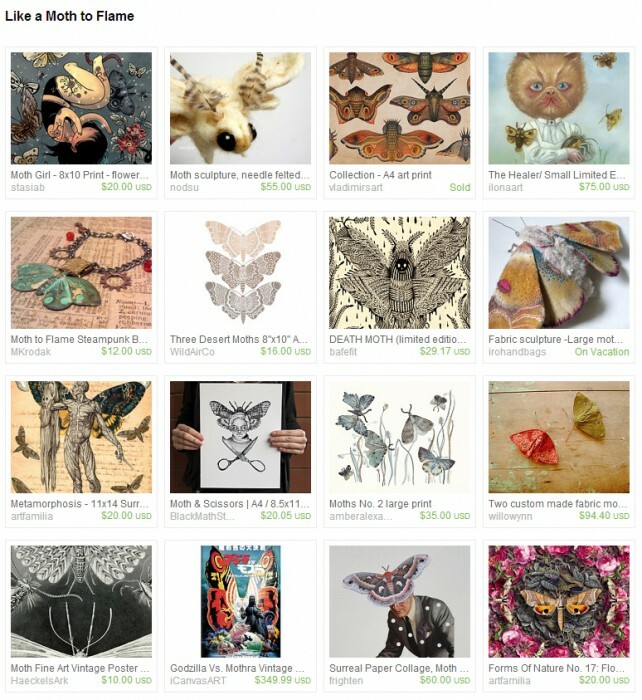 This entry was posted in Collections & Discoveries, Etsy Treasury and tagged Collection, Etsy treasury, Insect, Moth, Science on 18July 2014 by Leah.